Travel systems are the life-savers of harried new parents who have errands to run, but who do not want to wake their sleeping baby. Transferring baby seamlessly from the stroller to the car to inside the home without disturbing your little one gives you the freedom to plan your day the way you need to, instead of waiting around for Jr. to finish his nap so you can go to the grocery store. 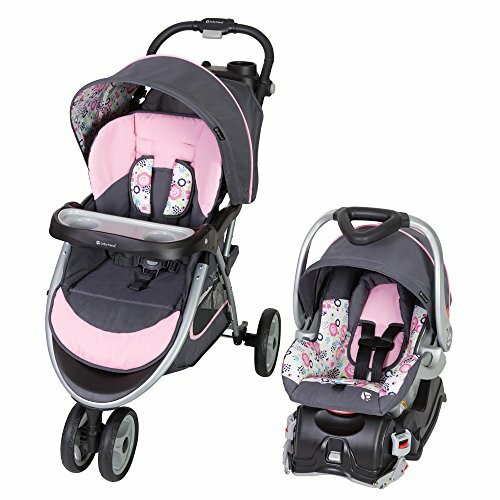 Baby Trend has three popular versions of their travel systems. The single stroller is ideal for the new parents of one baby. The Sit N Stand is for families who have two kids of different ages, usually a toddler who likes to stand up and move around, with a sibling who is as young as a newborn. The last option is for active parents who like to power walk or go on easy jogs. The jogger is not meant to be used with the car seat while jogging, though, but walking is fine and encouraged. Each Baby Trend travel system comes with a Flex Loc or EZ Flex Loc car seat. Both of these car seats are top rated best sellers. They can hold between 5 pounds and up to 22 or 30 pounds, depending on the travel system you choose. Parents appreciate the folding canopies of both the car seat and the stroller so that when the car seat is in place, the baby is completely covered. This is beneficial when the weather isn’t all that great. Reviewers say that the triangular-shaped grip on the car seat makes it easy to carry, it is easy to install and has a sturdy seat. 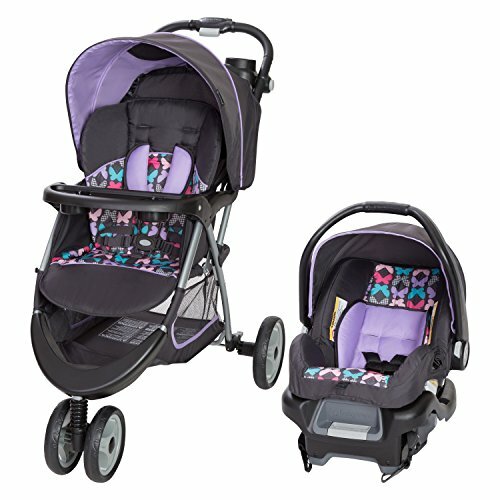 Other moms like the color palettes available in this Baby Trend travel system and the large storage basket under the seat. Many mentioned that the stroller was easy to assemble. 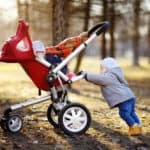 Unfortunately, the negative Baby Trend travel system reviews are more than double the number of positives, especially about the stroller. 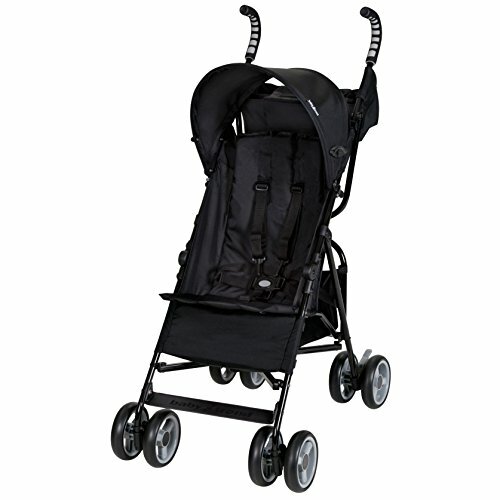 The stroller can become difficult to steer after a few months of use, one reviewer commented. This mom also said that because her car seat did not have a head support, she had to improvise a towel for her newborn’s head and neck. Another big complaint is about the fabric. Although quite nice to look at, (parents rave about the cool patterns) the quality of the fabric has much to be desired because it tears far too easily. Several moms have noticed that the stroller is difficult to fold and unfold. 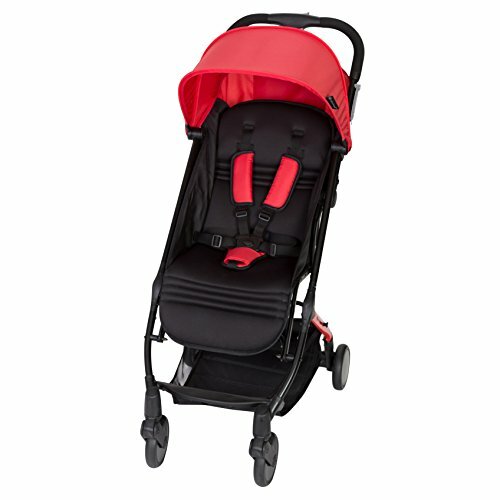 A couple of reviewers had said that the stroller almost closed in on itself while their child was still in it! There were also few remarks that the wheels either crack or fall off and their hard plastic surface makes for a bumpy ride. Complaints about the weight and bulk of this stroller were also voiced. The repeat issue about the car seat was that the handle was difficult to put down. This particular Sit N Stand model is only available in Canadian BabiesRUs stores, and the few reviews it has received so far have been outstanding. Both were five-star Baby Trend travel system reviews with moms saying that getting into the storage basket was easy and that their older child enjoyed riding in the back, even with the car seat in place in the front in travel-system mode. It was also said that the stroller folds up as compact as a single stroller, which was a huge positive for this mom. Don’t live in Canada? You won’t be able to get the Sit n Stand together with the car seat as a set, but here’s some good news: You can get a Baby Trend Flex Loc infant car seat in the same color as your Sit N Stand stroller There are dozens of options available, and Baby Trend co-ordinates their stroller colors with their car seats. 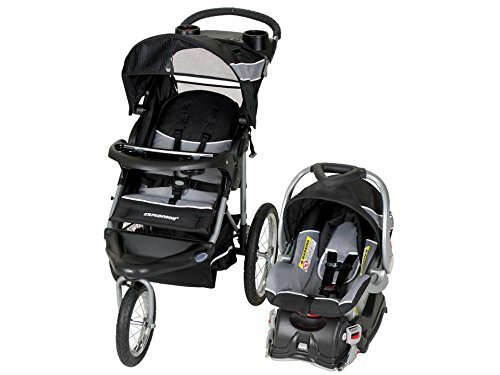 This is a great stroller for taking brisk walks in the park and the Expedition model is also the most popular Baby Trend jogger. Moms and Dads love the affordable price and the sporty look. 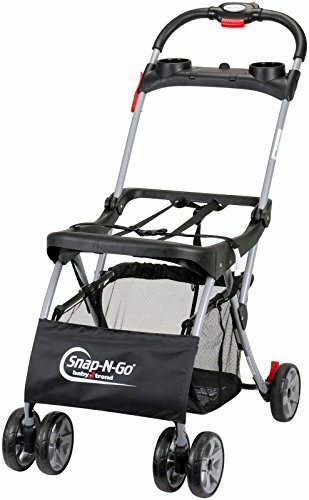 This is an all-terrain stroller that can go over various surfaces such as dirt trails and roads, cracked sidewalks, gravel and bike trails. Most parents who get this stroller are not serious runners or avid joggers, but they do like getting out for brisk walks. The swivel feature on the front tire is a must for maneuverability, but for those who do jog, then the front tire has to be locked to keep the stroller stable during the ride. Click for a more detailed review of the Baby Trend Expedition strollers. Parents who’ve purchased this Baby Trend travel system say that the car seat is great; they love the ergonomic handle and the sun canopy. First the good news: the complaints about the Expedition travel system are much, much better than for the single Expedition jogging stroller. The wobbly wheel problem that you’d read about in the full Baby Trend Expedition jogger review doesn’t occur in the travel system reviews. One recurring complaint about this Baby Trend travel system is that once the seat is put into place in the stroller, the car seat’s incline is too upright for a newborn. The sun canopy on the stroller is said to be insufficient and remarks that the stroller is too heavy and bulky. Another reviewer had problems with tires going flat repeatedly and one mother had a preemie baby weighing six pounds who was just too little for her big travel system.